Originally posted on http://scitechconnect.elsevier.com, December 16, 2016 . 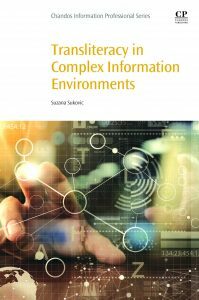 The post refers to a chapter in the book “Transliteracy in complex information environments”, published by Chandos. Scholars who do cross boundaries against the rules of their discipline, would do so because information is perceived as critical or there is a perception that a ‘life in the round’ is no longer functioning. Rapid changes in academia, inconsistent systems of promotions and evaluation of scholarly work, as well as conflicting expectations, indicate that academic life is functioning with a number of difficulties. Participant 15/1 talked about experimenting ‘without an umpire’ in mind in the environment in which some peers are interested in experimental work with the multiplicity of resources while others do not think that it meets scholarly standards. According to this participant, scholars who work in new fields start within a traditional disciplineand gradually split away when another community takes shape. In a metropolis, news travels fast and it is impossible to maintain local customs untouched, but that does not negate the existence and influence of small villages. The balance between the preservation of a village life and the interaction with the metropolis — sometimes threatening, sometimes alluring – is in flux even in the most sheltered villages. The first sentence I wrote for this blog post was this: “Perhaps this isn’t the best way to start a blog post for C-EBLIP but I have a confession to make: I am deeply suspicious of evidence.” The more I wrote, the more I realized that everyone is (or should be) deeply suspicious of evidence. We need to think about it carefully and critically and ask the difficult questions of it. The more I wrote about my distrust of evidence, the more I realized that it wasn’t evidence per se that gave me pause, but how evidence is generally defined and approached in LIS. I think what I really meant when I said “I am deeply suspicious of evidence” is that I am deeply suspicious of numbers and the concept of “indisputable facts.” There are always, I think, more sides to the story than numbers can convey and when I see charts, figures, and graphs, I am always looking for the other parts of the story, the absent narratives, the “random dots,” the findings off the grid. What are the things these numbers aren’t telling us? My feelings toward evidence could easily be explained by the fact that I am a literature scholar turned information literacy librarian. In both fields, we are trained to look at “evidence” in particular ways. My next blog post will consider what humanities-based modes of thinking could contribute to evidence based library and information practice (EBLIP) but in this post I’d like to pick up something that Denise Koufogiannakis (2013) raised in her EBLIP7 keynote. She observed that “EBLIP’s focus to date has been on research evidence and how to read and understand research better. This is a good thing (I certainly do not want to diminish the importance of the work that has been done in this respect)–but it is not the only thing–and we must begin to explore other types of evidence” (9). Like Denise, I do not want to diminish the importance of the work being done in EBLIP and my questions about EBLIP are not to challenge or undermine the work done in this area. Rather, in this blog post, I want to respond to what I read as an invitation from Denise to “explore other types of evidence.” What other evidence types might there be? And what might these other types of evidence contribute to EBLIP, to research, and to librarianship? In this and my next blog post, I will be pondering some of these issues and invite others to join me in thinking through these ideas. As I read in the field of EBLIP, I often wonder where librarians like me, with ties to the humanities, might fit in with evidence-based work. But as I write this, I pause because it’s not that my research, practice, teaching, and thinking aren’t informed by evidence—it’s just that the kind of evidence I summon, trust, and use is not easily translated into what usually constitutes “evidence,” formally and informally. Perhaps I am the kind of librarian who Denise (2012) describes here: “The current model may be alienating some librarians who feel that the forms of evidence they are using are not being recognized as important” (6). One cannot quantify theoretical thoughts or chart reflective practice; some researchers might view this kind of evidence as soft at best, inadmissible at worst. For a while I thought it might make sense, as the song says, for me and EBLIP to call the whole thing off. However, the more I think about EBLIP the more I think there might be something worth considering. I realize that it’s not that I distrust evidence: I am skeptical of a certain kind of evidence. Or, phrased another way, I trust a different kind of evidence, a kind of evidence I don’t often see reflected in EBLIP. My argument is not that EBLIP needs to change so that those of us with humanities backgrounds and humanities ways of thinking feel personally included or intellectually welcome in EBLIP endeavours. My argument is, instead, that humanities ways of thinking about evidence could offer EBLIP perspectives and approaches that might take us in new directions in our thinking, research, scholarship, and practice. For those of us working with students and information literacy, we know that we can attempt to understand their experiences quantitatively or explore their thoughts and habits qualitatively. But again, to my mind, these kinds of studies are only part of the information literacy story: findings need to be contextualized, studies problematized, evidence questioned, “random dots” explored, premises and practices reflected upon and theorized. When we consider students—or any segment of user communities—in library scholarship we need to remember that we are studying complex, changeable people who themselves cannot be reduced into charts and graphs. Any “answers” we may find may raise more questions, and arguably, they should. EBLIP’s suitability for helping us make decisions has been well-explored and theorized. I’m wondering if we could also use evidence—writ large—to help us ask new questions of our practices, our selves, our research and our profession.